Web of Science: What can you tell me about diving sea birds? What can you tell me about diving sea birds? The term sea birds means birds whose habitat is closely related to the sea. Their food is mostly or excluslively from the sea and they usually nest by the coast. Sea birds can be divided into three groups depending on whether they use their feet, wings or both when swimming (Storer, 1960b). Birds that use their wings to swim are usually ocean birds while those that use their feet are a majority in coastal regions or lakes. The reason is thought to include the fact that coastal environments and lagoons are usually more varied than the open seas, making it more difficult to use the wings for swimming. There are very few examples of birds using both their feet and wings for swimming. 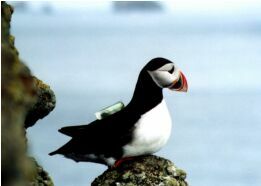 About 30 species of sea bird live in by Iceland's coasts, with varying foraging techniques. Birds like the fulmar, gull and kittiwake use their feet to paddle around on their surface, then submerge their head or beak to reach their food. For these species it could be waste from boats, cod bait, fry, copepods or other zooplankton. The eider duck is a very common sea bird on Iceland's shores and is a busy diver. It uses its feet to dive in shallow waters and disturbs the bottom sediment to seek out tiny gammarus, mussels and other bottom dwellers. The cormorant and red-throated diver are also good divers, and like the eider duck they use their feet when diving for food. The density of water is 850 times more than that of air, which means that the power needed to flap wings is much more in water than in air - four times greater, calculated from the same Reynold's number (Vogel, 1994). This fact means that any specialisation in a bird towards the use of wings in diving will have a significant effect on its flying capabilities. The extreme specialisation for life in the sea that can be seen in penguins has resulted in them becoming flightless - but in return they have incredible diving capabilities. Research on emperor penguins (Aptenodytes forsteri) in Antarctica has shown that they can dive to a depth of 530 metres and be submerged for more than 15 minutes at a time. As with penguins, birds of the auk family (Alcidae) use their wings to dive and as a result they have less flight capability than most other birds. One member of this family went so far in this development that it became completely flightless, like the penguin. This was the great auk (Alca impennis), now extinct, whose wings were too small to enable flight. Though the great auk had few natural enemies, that did not save it from extinction. Being flightless, it was easy prey for fishermen, who did not realise how small stocks had become. The last great auks were killed on Eldey, off Iceland's Reykjanes peninsula, in 1844. The puffin (Fratercula arctica) (image 1) also belongs to the auk family. It is called the clown of the air in some countries, as its flight appears clumsy. But the puffin is a very adept diver and research at the Westmann Islands department of the University of Iceland has shed new light on its abilities in this field. By fixing a so-called DST-electronic tag on the back of a puffin it was possible to make measurements including exactly the depth to which they dive, how often and the duration of each instance (image 2). It was also possible to measure the speed at which the puffin dove to its greatest depth and back to the surface. Older research shows that the puffin can dive to a depth of up to 60 metres and can remain submerged for more than 110 seconds. Research at the Westmann Islands confirms this, as the greatest depth recorded with the DST signals was 57 metres and the longest duration was 108 seconds. 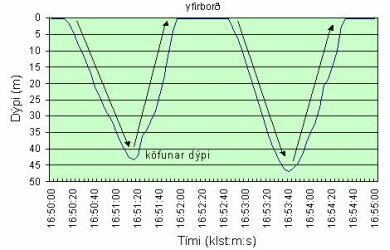 Image 3 shows a typical diving sequence measured with DST signals. The puffin dives twice during a 5 minute period to depths of over 40 metres, i.e. 43 and 47 metres. But most puffin dives do not reach 40 metres. During nesting, the birds usually restrict their movements to a radius of 2-3 kilometres from the nest, and most of their dives are to a depth of 5-10 metres and last for something between 20 and 60 seconds. When foraging in the open sea, the puffin spends 38% of its time underwater and dives on average about once a minute. The speed of the dives can exceed 5kmh, which is remarkable, given the size of the bird. It is the vertical depth of the prey, normally sand eel(Ammodytes tobanius) that mostly determines the depth of the dives. Despite the fact that the puffin's abilities as a diver are great, both the guillemot (Uria aalge) and razorbill (Alca torda) can dive deeper and longer. Foreign studies have shown that the razorbill can dive to 140 metres, while the guillemot can dive to 180 metres (table 1). These are incredible depths, as pressure in sea water at 180 metres is 19.5 kg/cm2 or 290 psi (pressure increases by 1 kg/cm2 for each 9.75 metres of depth of the dive). There is little known about how the auks can withstand such depths, where e.g. the pressure at 180 metres causes the volume of the lungs to diminish to 1/20th of their volume at the surface. Research on penguins indicates that the processes include the closing of blood supply to tissue, so that only the most essential tissue gets oxygen, such as lung and brain(Kooyman og Poganis 1994). In this way the birds can both greatly extend the duration of their dives and avoid the build-up of nitrogen in their blood. Greatest dive depth and duration of three species of auk and of the emperor penguin. The queen of the Atlantic, the gannet (Morus bassanus or Sula bassana) uses a very special technique when foraging. It glides high above the surface of the sea in its search for food then suddenly plummets when it has found an interesting prey. Just before breaking the surface it lays its wings back and peirces the sea like a spear to sieze its prey. It has been estimated that gannets can commence their dive at heights of up to 50 metres above the surface. The examples given above show that the methods and attributes employed by sea birds when diving are very varied, and that in fact there is little known about this activity. To be able to both fly in the skies and dive to great depths is in itself a rare ability. Man has not yet been able to design an effective vehicle that has these sea bird attributes. The thought that this might be possible in the future is at once attractive and exciting. Vogel, S. (1994). Life in moving fluids. Princeton, NJ: Princeton University Press. 467pp. Wanless, S., J.S. Morris and M.P. Harris (1988). Diving behaviour of guillemt Uria aalge, Puffin Fratercula arctica and razorbill Alca torda as shown by radio telemetry. J. Zool., Lond.216,73-81. Páll Marvin Jónsson. „What can you tell me about diving sea birds? “. The Icelandic Web of Science 9.3.2006. http://why.is/svar.php?id=5696. (Skoðað 21.4.2019).